During this week, November 13-18, the 6th World Assembly of the Global Campaign for Education (GCE) is being held in Kathmandu, Nepal. In this conference, GCE members and partners from all four corners of the world gather to discuss crucial and emerging issues regarding education. The Global Campaign for Education is the world’s largest civil society organisation working to make the right to quality education a reality for all. The World Assembly, held every four years, is the governing body of the Global Campaign for Education, which brings together members of the GCE organisation to reflect over the achievements of the organization, share the knowledge gained during the previous period, discuss current and emerging issues in global education and participate in shared strategic planning for the next four years. Lucía Rodríguez Donate from Fe y Alegría International Federation and Luis Carlos Soler, representative of the Red Generación 21+, are currently in Nepal. The World Assembly is one of the largest international gatherings of campaigners in the education sector. The theme of the 6th World Assembly is “Transforming education systems to achieve equality, inclusion and justice”. The topic reflects the fundamental belief of the Global Campaign for Education that education is a human right, and that quality education for all is achievable if both governments and the international community have the necessary political will to engage and invest in education policies. It also defines the central strategic areas of focus for the Organisation in the upcoming years. It will bring together all national and regional members who are currently funded by the FRESCE program and who often do not have the opportunity to work together in the regions, only about every three or four years, therefore, it is a great chance to discuss in depth, share challenges and successes and to learn from each other. It will have three highlights: a one-day policy forum for a high-level debate on the future of education, a reflection on the impact of GCE and on how to move forward to achieve the targets of SDG 4 that will result in the new GCE strategic plan and policy r, and the election of the Board and the new GCE president. You can follow all about the Assembly on the Facebook and Twitter accounts from the Global Campaign for Education Spain or through the hashtag #GCEWorldAssembly2018. The International Literacy Day will be celebrated all around the world. The main global celebration of the day will take place at UNESCO Headquarters, Paris in the form of a two-day conference on 8 – 9 September, the highlight of which will be the awarding of the Literacy Prizes. At the same time the Global Alliance for Literacy (GAL) will be launched, a new and ambitious initiative to make all major stakeholders pull together to promote literacy as a foundation for lifelong learning. Check out the information (in English ) on the various ups and downs of adult literacy showing the following infographic and points out that, despite numerous international agreements since 1960, there is little to celebrate as more than 758 million people are still illiterate in the world and this represents 15 % of the world population . As a finishing touch to the “Networking for Justice” meeting that took place in Loyola from the 16 to the 20 of November and in which 60 people from different continents, Jesuits and laypeople and people from various sectors of the Society of Jesus, including the four Global Igantian Advocacy Networks that work in migrations, the right to a quality education for all, ecology and governance of natural and mineral resources participated, the last ones participated as well in a Round table at the Comillas University in Madrid, Spain, last Monday the 23 of November. The Round table was entitled “Global challenges, networking responses” and was chaired by the Rector of the University, Julio L. Martínez and Marta Muñiz, Head of ICADE Business School. Some leaders of the GIAN networks intervened in the colloquium: Benny Juliawan, leader of the Migrations network, Lucía Rodríguez and Augustin Kalubi, leader and member of the network for the right to education respectively, Julie Edwars, leader of the network for the governance of natural and mineral resources and Daniel Villanueva, the director of the Spanish NGO Entreculturas. 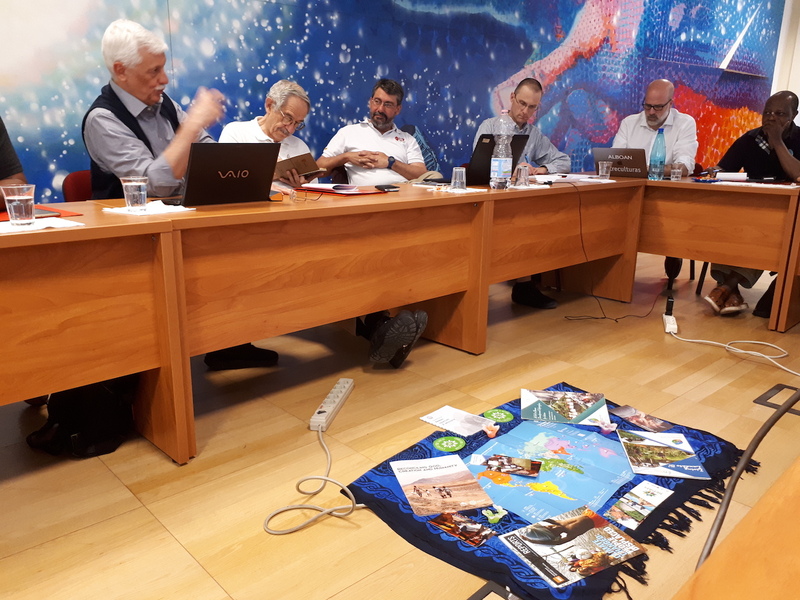 The meeting was an opportunity to share some lessons learned from the networking that has been carried out at a global level by the Society of Jesus since 2008, in areas such as ecology, migrations, natural resources or education. Lucía Rodríguez started off by stressing the need of this new way of organization to deal with the repercussions of globalisation for the most vulnerable. She also highlighted the strengths of the Society of Jesus when it comes to networking as it has been an international apostolic body since its creation. She also explained how this new working procedure demands a new organisational culture in which it is essential to constantly search for synergies and resources, dialogue, a shared leadership and high motivation, generosity and dedication. The speakers shared concrete networking experiences: in the Migrations network, they presented a vision of a possible legislative strategy that would have to take into account the diversity of migratory flows in the world, the awareness campaign of the Governance of Natural Resources network with Alboan about the extractive industry and the use of minerals in electronic devices, or the monitoring and participation of the network for the Right to Education in the international education agenda towards 2030. The Round table finished with the words of Daniel Villanueva in the hopes that the meeting would open channels of collaboration with the academy and with the motivation that the ground covered by the networks up until now together with the internal cultural change that the Society is experiencing will be useful to work together and horizontally for global justice and the most vulnerable people in the world. On Saturday, 14 November at 12pm, 15 refugees, as well as staff and friends of the Jesuit Refugee Service (JRS), will attend a private audience with Pope Francis. The Pope will speak about the importance of education for refugee children and youth as a means to build peace and foster the development of more resilient and cohesive societies. The event will commemorate the 35th anniversary of JRS, founded by the former Superior General of the Society of Jesus, Pedro Arrupe SJ. Pope Francis has long urged Catholics to welcome refugees, saying the world is currently suffering from a “globalisation of indifference,” ignoring those who cry out for mercy. On Saturday, as a precursor to the Holy Year of Mercy to launch on 8 December, the Pope will formally recognise and pledge support for the JRS Global Education Initiative, an initiative aimed to extend JRS’ educational programmes to 100,000 additional refugees by the year 2020. Refugees face a variety of barriers trying to access education, from overcrowding in schools to xenophobia in host communities. Their fundamental right to education is often lost. Among refugee children, only 36% globally go to secondary school and less than 1% have the opportunity to pursue a higher education. For 35 years, JRS has provided quality education as a tool for people to better fulfill their own potential and fully contribute to the growth, strength and stability of their communities. Schools allow those who have been forced to flee their homes to rebuild a shared space, a community, a sense of normality. Pope Francis has historically called the public to protect refugees and care for the most vulnerable. Access to education can keep children safe and protected from risks, including gender-based violence, recruitment into armed groups, child labor and early marriage. The Jesuit Refugee Service programmes are found in 45 countries, providing assistance to: refugees in camps and cities, individuals displaced within their own countries, asylum seekers in cities, and to those held in detention centres. The main areas of work are in the field of education, emergency assistance, healthcare, livelihood activities and social services. At the end of 2014, JRS employed approximately 1,400 staff: lay, Jesuits and other religious to meet the education, health, social and other needs of nearly 760,000 refugees and IDPs, more than half of whom are women. Services are provided to refugees regardless of race, ethnic origin or religious beliefs. Coinciding with the general elections that took place last weekend in Guatemala and that have concluded with the election of Jimmy Morales as President of the country, a large pool of Jesuit educational institutions have presented EJEGUA, a proposal for educational priorities that the new President will have to take into account in order to guarantee a public educational system that lives up to the Guatemalan population. This advocacy initiative is mainly driven by the Rafael Landívar University -URL-, the Loyola school, the Javier Lyceum, the Educational foundation Fe y Alegría, the Guatemalan Institute of radiophonic education -IGER- and the labour educational Project Puente Belice. Currently, these institutions offer training at all educational levels for more than 100.000 boys, girls, young people and adults distributed all over the country. From high school to university level, and in different modalities of formal education, formal and non-formal extracurricular education and technical professional training. Thus, they believe that the current circumstances that the country is going through represent an opportunity to become an inter-institutional group that contributes to the analysis and the proposal to improve the educational situation in Guatemala, as nowadays it presents serious problems that especially affect vulnerable groups. This document proposes the reduction of the educational desertion and the extensive coverage, “strengthening the general scholarship programs and the scholarships for the accelerated formal education or second chance education for young poor people that abandoned the educational system, can open a window of opportunity for them.” They alert about the high percentage of young people that don’t study nor work (25,1% or around 800.000 youngsters according to the INE) and propose the strengthening of the comprehensive technical training and the generator of decent employment opportunities by the State. Moreover, they propose the improvement of the educational quality from the learning methods and subjects, including fundamental competences for life using learning contexts that encourage their development as active citizens that are engaged with the social and environmental surroundings in which they live. They also highlight the importance of endowing the educational system of quality, with well trained and well-paid educators and from the relevant and adapted education centres. While other countries already exceeded the 6%, Guatemala only destined the 3.2% of their GDP for education in 2015, therefore, in the document they urge to increase social investment improving the fundraising and reducing corruption, to create alliances with other state and autonomous institutions that could support education. Lastly and as a revindication against the short termism of the public policies, they think that the educational priorities and the budget allocation for this policy can’t suffer any electioneering alterations and should be established as a priority for the State of Guatemala. The 45th edition of the Fe y Alegría International Conference has taken place from the 16th to the 19th of October under the motto “Youth Culture, Citizenship and Peace” in the city of Barranquilla, Colombia. This is a yearly gathering for the 21 national Fe y Alegría representatives currently present around the world. In its 45th edition, more then 60 youngsters between the ages of 16 and 22 years old attended the conference as representatives of every country where the International Federation is present; Nicaragua, Colombia, Italy, Spain, Haiti and Chad among others. The goal of this encounter was to dialogue about what it means to be a young woman and a young man today: who they are, what they are doing, what are their challenges, what are the demands of their social contexts and how they can contribute to generate proactive participation and a culture of peace in their places of origin and the world. According to the last United Nations report on “the State of the World Population”, there are about 1.800 million youngsters in our planet. This means that today more than 25% of the world population is aged between 10 and 24 years old. Adolescence is a very special stage for the development of one’s full potential to live a life with dignity and encourage responsible participation in public life. Fe y Alegría is clear and speaks about “youth” from an inclusive, rights and gender-based perspective as an acknowledgment of the diversity of people and realities, since there is a great complexity and differences among young people today depending on the social, cultural, political and economic contexts in which they live. 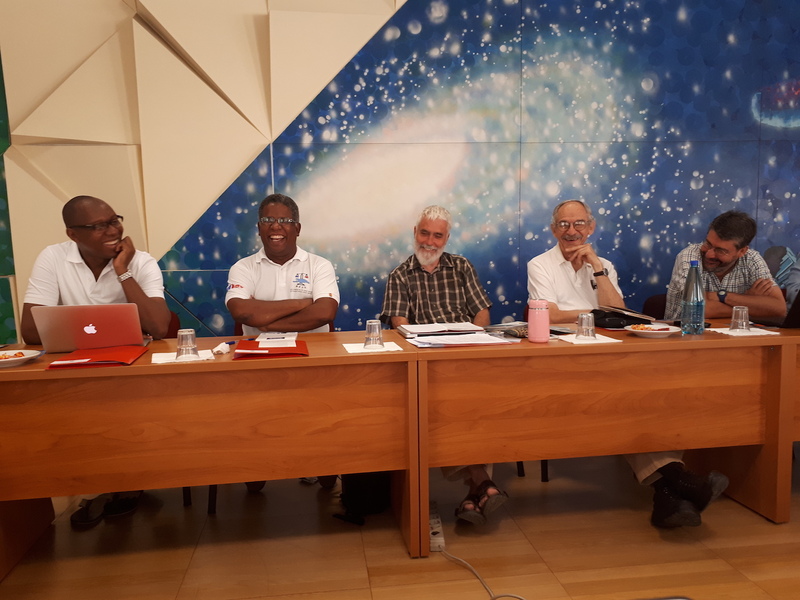 Acknowledging the importance of this group of people, the International Federation Fe y Alegría agreed to address the 2015 Conference to youth in order to listen to their reflections, wishes and challenges in their path towards personal development. The new Federative agenda to be developed in the next years will arise from these contributions and, therefore, be the guidelines to follow in the work with youth from the different countries that make up this movement. and the Youth Manifest just published today (in Spanish). I vote for education, and you? The Global Campaign for Education (GCE) is an international colation made up of NGOs, teacher’ unions and other civil society movements commited to education. It was established in 1999 and delivered a united civil society voice during the World Education Forum in Dakar in 2000, influencing the six Education for All goals. Since then GCE has continued to grow and some important progress has been made, including 40 million more children in school. However, far more still needs to be done to realise the right to quality education for all. Close to a billion people right now are being denied the education that would change their lives. GCE campaigns throughout the year, mobilising pressure from all sectors and holding governments and international institutions to account. During this week and under the slogan “I vote for education, and you?” the GCE is campaigning to encourage new international commitments towards 2030 through the Education World Action Week in more than 120 countries in the world. 2015 is a crucial year for granting education because there are several international appointments that will deal with this topic and will set the new horizon to work on; in September 2015, the international community that will meet at the United Nations Assembly, will review the Millennium Development Goals adopted in 2000 and will take on the new Sustainable Development Goals. This review will highlight that in education matters, although there have been some important progress; there are challenges we need to face urgently. For example, the fact that, still today, there are 58 million girls and boys who have no access to schooling and there are 775 million adult people, two thirds of them who are women are illiterate. The United Nations Assembly of September 2015 is an extremely significant date, because the new global development agenda for the next 15 years will be set. As it can inferred from the My World 2015 survey, from United Nations, there is a huge calling from the citizens of all over the world to make education the backbone of the new development Agenda. The appointment of September can become a great chance for the international community to demand the effective accountability of the right to education for everyone. But just any kind of education will not work. The kind of educations we should stand for is an universal one, for everyone. This quality education must provide people not only with knowledge and basic skills, but also with fundamental attitudes and values to get through life. It must be an equitable education, that places excluded groups of, boys and girls, young groups and collectives in the first place: impoverished families, young girls, and ethnic minorities, those who live in countries facing armed conflicts, in refugee status, displaced o migrations, with particular educative needs, among others. It must be an inclusive education, that respects and adapts to children and young groups needs and that it embraces and values diversity, considering it an important strength. It is an education that includes lifelong learning and it has a social transformation willingness promoting global citizenship. In Spain, under the slogan “I vote for education, and you?” , the coalition lead by several NGOs like Entreculturas, and ALBOAN, Jesuit NGOs for cooperation development, are organizing 29 mobilisation events in more than 25 cities where there will be more than 7.000 students, activists, teachers, political representatives and 170 educative centers. In its website www.cme-espana.org/yovotoporlaeducacion they are runing different actions to support education such as taking a picture with #yovotoporlaeducacion, participate in educative games likehan puesto en marcha diferentes propuestas que van desde hacerse una foto con el #yovotoporlaeducacion, a participar en juegos educativos como el “Twister of education” or representing “United Nations Assemblies“. The aim is to add on as much people as possible to this project which is showing support to a quality education for everyone. The main demand is that the Spanish Government commits into building both agendas, looking out for education to be one central goal and it is placed in the centre. Spain must increase its Official Development Assistance contribution for education, reaching at least what it has been asked in the Cooperation Comission of the Spanish Deputies Congress of assigning 8% of the total billateral ODA to basic education.